This is the answer to parents' prayers: the PET712 has a pair of 7in screens, so kids can watch the same movie on separate screens. 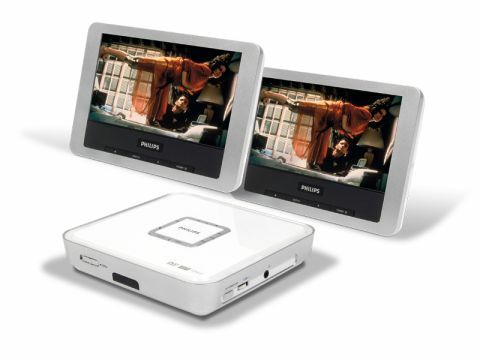 Pictures are supplied to both via a compact square-shaped player, cutely styled in white and silver. It feels a little flimsy, but its shock-proof construction means it should withstand a few knocks. The player is connected to the screens using the two supplied minijack-to-phono adaptor cables, and it outputs composite video and stereo audio to each one. The screens also hook up to the player's DC input, and the whole unit is powered by a car cigarette lighter (there's no rechargeable battery). The resolution of each screen is 480 x 234 pixels, which isn't ideal for DVD playback, but each panel is anti-glare and has independent volume, brightness and contrast controls, plus separate headphone outputs that are preferable to the weak built-in speakers. There are no USB or SD card slots, but the remote is simply laid out, with well-sized buttons and clear labelling. The lack of dedicated scan buttons is annoying. Picture quality is decent enough, but the clear pixel structure gives the image a gauzy, jagged aspect and haphazard fine detail reproduction, none of which is helped by the composite video feed. It is aimed at kids, though, and they'll likely be more than happy.